Not to be confused with Antiarchi. Acritarchs are organic microfossils, present from approximately 3.2 to 1.4 billion years ago to the present. Their diversity reflects major ecological events such as the appearance of predation and the Cambrian explosion. Acritarchs were originally defined as non-acid soluble (i.e. non-carbonate, non-siliceous) organic-walled microfossils consisting of a central cavity, and whose biological affinity cannot be determined with certainty. Most commonly they are composed of thermally altered acid insoluble carbon compounds (kerogen). Acritarchs may include the remains of a wide range of quite different kinds of organisms – ranging from the egg cases of small metazoans to resting cysts of many kinds of chlorophyta (green algae). It is likely that most acritarch species from the Paleozoic represent various stages of the life cycle of algae that were ancestral to the dinoflagellates. The nature of the organisms associated with older acritarchs is generally not well understood, though many are probably related to unicellular marine algae. In theory, when the biological source (taxon) of an acritarch does become known, that particular microfossil is removed from the acritarchs and classified with its proper group. While the classification of acritarchs into form genera is entirely artificial, it is not without merit, as the form taxa show traits similar to those of genuine taxa - for example an 'explosion' in the Cambrian and a mass extinction at the end of the Permian. Acritarchs were most likely eukaryotes. While archaea, bacteria and cyanobacteria (prokaryotes) usually produce simple fossils of a very small size, eukaryotic unicellular fossils are usually larger and more complex, with external morphological projections and ornamentation such as spines and hairs that only eukaryotes can produce; as most acritarchs have external projections (e.g., hair, spines, thick cell membranes, etc. ), they are predominantly eukaryotes, although simple eukaryote acritarchs also exist. Acritarchs are found in sedimentary rocks from the present back into the Archean (although the Archean and early Proterozoic microfossils termed "acritarchs" may actually be prokaryotes, since eukaryotes had probably not evolved until the mid Proterozoic). They are typically isolated from siliciclastic sedimentary rocks using hydrofluoric acid but are occasionally extracted from carbonate-rich rocks. They are excellent candidates for index fossils used for dating rock formations in the Paleozoic Era and when other fossils are not available. Because most acritarchs are thought to be marine (pre-Triassic), they are also useful for palaeoenvironmental interpretation. 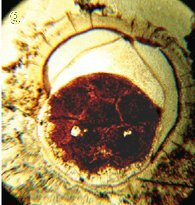 Microfossils called "acritarchs" have been recovered from sediments deposited as long as 3.2 billion years ago (although these early examples were almost certainly the remains of prokaryotes, since eukaryotic cells didn't likely evolve until the mid Proterozoic. At about 1 billion years ago the organisms responsible for acritarchs started to increase in abundance, diversity, size, complexity of shape and especially size and number of spines. Their populations crashed during periods of extensive worldwide glaciations that covered the majority of the planet, but they proliferated in the Cambrian explosion and reached their highest diversity in the Paleozoic. The increased spininess 1 billion years ago possibly resulted from the need for defence against predators, especially predators large enough to swallow them or tear them apart. Other groups of small organisms from the Neoproterozoic era also show signs of anti-predator defences. Further evidence that acritarchs were subject to herbivory around this time comes from a consideration of taxon longevity. The abundance of planktonic organisms that evolved between 1,700 and 1,400 million years ago was limited by nutrient availability – a situation which limits the origination of new species because the existing organisms are so specialised to their niches, and no other niches are available for occupation. Approximately 1,000 million years ago, species longevity fell sharply, suggesting that predation pressure, probably by protist herbivores, became an important factor. Predation would have kept populations in check, meaning that some nutrients were left unused, and new niches were available for new species to occupy. Acritarch was coined in 1963 from the Greek ákritos meaning confused (a kritēs, without critic) and archē meaning origin (confer archaic). ^ Evitt, William R. (1963). "A discussion and proposals concerning fossil dinoflagellates, hystrichospheres, and acritarchs, II" (PDF). Proceedings of the National Academy of Sciences. 49: 298–302 – via PNAS. ^ Colbath, G.Kent; Grenfell, Hugh R. (1995). "Review of biological affinities of Paleozoic acid-resistant, organic-walled eukaryotic algal microfossils (including "acritarchs")". Review of Palaeobotany and Palynology. 86 (3–4): 287–314. doi:10.1016/0034-6667(94)00148-d. ISSN 0034-6667. ^ Buick, R. . (2010). "Early life: Ancient acritarchs". Nature. 463 (7283): 885–886. Bibcode:2010Natur.463..885B. doi:10.1038/463885a. PMID 20164911. ^ "MONTENARI, M. & LEPPIG, U. (2003): The Acritarcha: their classification morphology, ultrastructure and palaeoecological/palaeogeographical distribution". Paläontologische Zeitschrift. 77: 173–194. 2003. doi:10.1007/bf03004567. ^ Javaux, E.; Marshall, C.; Bekker, A. (7 February 2010). "Organic-walled microfossils in 3.2-billion-year-old shallow-marine siliciclastic deposits". Nature. 463 (7283): 934–938. Bibcode:2010Natur.463..934J. doi:10.1038/nature08793. PMID 20139963. ^ Stanley, S. M. (2008). "Predation defeats competition on the seafloor". Paleobiology. 34: 1–21. doi:10.1666/07026.1.